Credit cards are about to experience a massive makeover in the United States. According to multiple sources, the American credit card industry is preparing to do away with the credit cards we are all-too familiar with and replace the magnetic strip with a microchip (we are the last major market to do so). The new cards, called EMV cards, will require special credit card readers in order to complete the transaction. Luckily for those using Square, the company has announced a new reader for EMV cards. Since its release, Square has been the credit card reader of choice for many small businesses. With its flat 2.75 percent fee for every transaction and ability to be used on smartphones as well as tablets, Square took the market by storm. Now, looking to keep its customers informed, Square has announced it will not be leaving its customers out to pasture when EMV cards swoop in to replace the decades old magnetic strip credit cards in Oct. 2015. Square will be accepting pre-orders for its EMV reader later this year with the intention of making sure all of its small business clients are able to process the new cards by the aforementioned date. The new reader will look much the same as the current model and will continue to be able to operate smartphones and tablets. 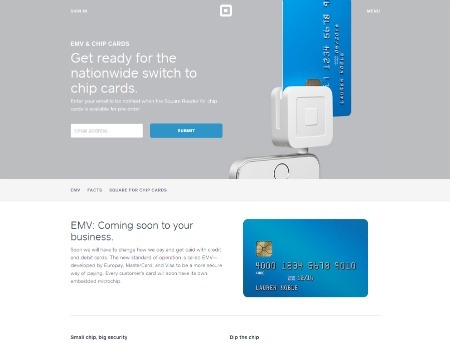 To help their clients stay informed, Square has set up a dedicated website for the new reader as well as a space to enter your email address to be notified when the EMV reader is available for pre-order.